BEFORE yesterday’s Oireachtas committee meeting, the FAI had two simple choices. They could seize the opportunity to restore some public faith into how soccer is run in this country by being honest, transparent and confidently answering the questions that were rightfully being put to them – or they could hide behind legal advice and do the absolute bare minimum. As Irish football supporters we have grown accustomed to defensive displays under the management of Giovanni Trapattoni and Martin O’Neill but this brought the notion of parking the bus to a whole new level. From very early on, it was pretty clear what sort of performance it was going to be from the FAI. 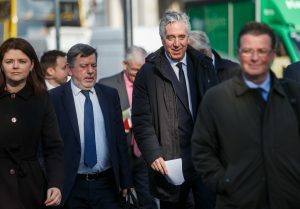 President Donal Conway made a long, meandering speech that tried to shift the focus away from the crux of what people wanted to know, the nature of the €100k loan by then then CEO John Delaney to the FAI. Any hopes of getting any real insight into how the FAI run their business was then scuppered by Delaney’s statement which basically confirmed that rather than fronting up and taking the opportunity to clear up any misgivings the public had about the FAI’s financial dealings he would be hiding behind legal advice. From there until the break for lunch, the FAI comfortably dealt with most questions. With Delaney refusing to answer any questions other than those relating to the post that he took up 17 days previously, Donal Conway was out in front and rarely looked flustered as the questions from the committee ranged from the inane to the irrelevant. The lunchtime break was the half time whistle just when the committee needed it. Whether they had their own team talk in the dressing rooms or just found a new individual focus within themselves, the afternoon session became a much more uncomfortable affair for the FAI. Senator Mark Daly could easily found have himself substituted after his performance in the morning but he was rejuvenated in the afternoon and by the end was pushing for man of match as his direct line of questioning suddenly had the FAI on the backfoot. Daly, though, was beaten to the man of the match award by Jonathan O’Brien whose footballing knowledge from his time with Cork City shone through as he posed searching questions. Others – like Robert Troy, Ruth Coppinger and Imelda Munster – could barely hide their disdain for those in front of them as the FAI continued to try duck, dive and dodge any serious questions. As always with these occasions there was an element of farce as well and where there is farce you can be sure that a Healy Rae won’t be too far away. “You’re a joke,” Ruth Coppinger told the Kerry TD after he decided to use his allotted three minutes to tell John Delaney how wonderful he was rather than ask a single question. And so the afternoon continued, ranging from the serious to the ridiculous. The honorary treasurer of an organisation with a €50m annual turnover not knowing how many bank accounts they had will surely go down in Irish folklore along with a Minister of Finance not having his own bank account as one of the more ridiculous revelations from these type of events. Ultimately however, the questions from the likes of O’Brien, Daly, Troy, Coppinger and Murphy and the FAI’s unwillingness or inability to answer them spoke volumes about how the association is run. There was in the end though no smoking gun, as if there could be in this format, but the FAI thinking this was a win for them was like celebrating a 0-0 draw without a shot on target when a win was needed to qualify for the World Cup. If their intention was to show up, do the bare minimum and tick the box of voluntarily attending the committee they succeeded but the fact that the FAI think like that continues casts a sorry shadow over the sport in the country. Donal Conway had stated they wanted to be clear and non-evasive and on another occasion spoke of how important it was that the Sport Ireland funding was restored as soon as possible and yet, their actions were a world away from those words. This was their chance to redeem the reputation of how the sport is run in the country but as always self-preservation was the priority. That was the real pity of the occasion and it was difficult to get away from the thoughts of chairman Fergus O’Dowd who finished both the morning and afternoon sessions, and then repeated on radio later in the evening, that it’s hard to imagine any public confidence in the FAI until there is significant personnel change on their board.